Sony's Venom is close to hitting theaters, but there's still a lot of mystery surrounding the film, even as more trailers are released. In a new interview, director Ruben Fleischer spoke about the possibilities of some other villains popping up in the movie aside from Riot. Anne Weying actress Michelle Williams even talked about She-Venom, insisting that it's something she is really interested in doing. Weying is Eddie Brock's girlfriend in the movie, but she has been his ex-wife in the comics and takes on the identity of She-Venom as well. 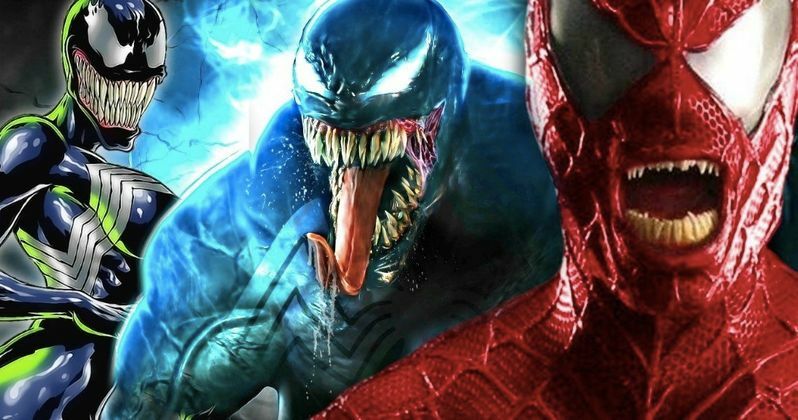 In a new interview, Ruben Fleischer talked about multiple villains in Venom, which sounds very interesting. Carnage has been teased ever since the movie was officially announced last year. Woody Harrelson has been rumored to be portraying the serial killer Cletus Kasady, aka Carnage, in the film, but that has yet to be confirmed at this time. Fleischer had this to say about seeing more than one villain in Venom. "There are other villains in the movie too - we're definitely planning a big world with these characters." When asked specifically about Carnage, Ruben Fleischer neither confirmed nor denied the villain's presence in Venom. Instead, the director stated that he thinks fans will have fun going to "see for themselves." Surprises are always better in a movie theater, but Woody Harrelson has all but confirmed that he is playing Carnage in the film. The actor has said that he plays a small part in Venom, but has an even bigger role to play in the sequel. It's important to note that Harrelson revealed these facts well before it was announced that Tom Hardy had signed on for three films. As for other characters, Michelle Williams says, "She-Venom would be a dream come true!" The inclusion of She-Venom would be a dream come true for comic book fans as well, but Williams' remarks make it seem like we won't be seeing the character in Venom. However, that doesn't mean that Anne Weying won't transform into She-Venom in future Venom installments. It will be interesting to see how the movie shows the relationship between Eddie Brock and Weying, especially since their comic book romance has gone through some rough patches. Sony's Venom movie is based off of the Lethal Protector comic book series, which featured Spider-Man as well. While it seems highly unlikely, fans are still holding out hope that Tom Holland's Peter Parker will make an appearance in the film. Venom hits theaters on October 5th and was previously thought to be rated PG-13. But it seems that Ruben Fleischer is unsure of the rating for the film at this time, which means that it could very well still end up with an R-rating. Fleischer says that he's curious to see where the movie will land on the rating system, so there's still hope. The Venom interviews were first published by Total Film.